Our aluminum door hood awning are made of aluminum for a longer lasting product and have durable baked enamel finishes, which are more resistant to fading and staining. Measuring for a door hood. Click for cheat sheet. To measure for a door hood, you need to know what size door you are covering, that will help determine the projection of the awning. You need to know how much space is available above the door before a soffit or another exterior product, this will help determine the wall height of the awning. You need to decide how wide you want the awning, whether to just cover the door or the door and an outside light or possibly the entire stoop area. 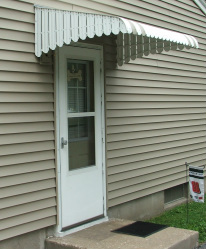 Once you have those measurements, its a snap to determine the correct awning for your door hood. Weather Whipper's two styles of awnings - ventilated and non-ventilated gives you the choices that best accommodate your protection against the elements.